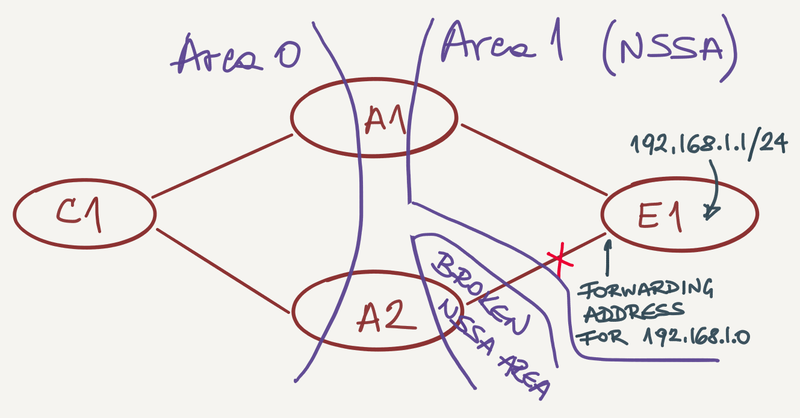 Remember the kludges needed to make OSPF NSSA areas work correctly? We concluded that saga by showing how the rules of RFC 3101 force a poor ASBR to choose an IP address on one of its OSPF-enabled interfaces as a forwarding address to be used in Type-7 LSA. What could possibly go wrong with such a “simple” concept? Let’s start with the network we used in the previous blog post. In the end of that blog post we shut down the loopback interface on E1 to force it to select something else as the Type-7 LSA forwarding address. While that resulted in suboptimal traffic flow, we could still ping 192.168.1.1 (IP address on a non-OSPF loopback interface on E1) from C1. Now let’s pretend the interface E1 chose is a Metro Ethernet link and it just failed in one of those mysterious ways where everything seems OK but no packets make it across the link. We’ll emulate this too-well-known behavior (never a Service Provider fault if you ask them) with an incoming deny ip any any access list. Service Providers are more thorough – they’d also drop ARP packets and everything else, but this ACL will do for our purposes. To make the fault look even more like a Metro Ethernet network, we’ll install the ACL only on E1 side of A2E1 link, resulting in a unidirectional link. 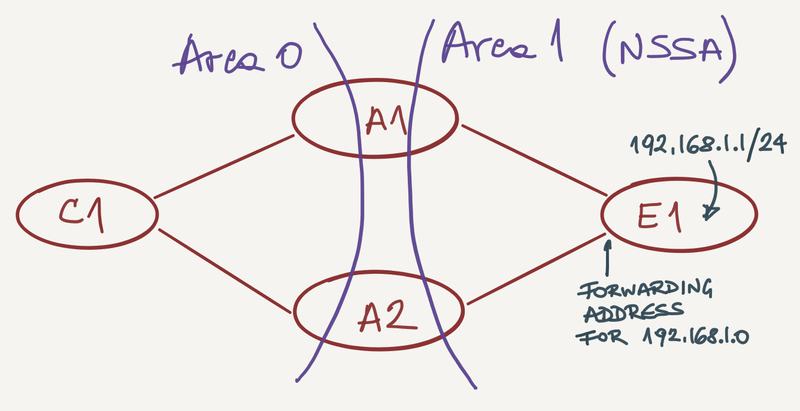 As expected, the OSPF adjacency between A2 and E1 goes down. Totally unexpected, C1 can no longer ping external subnets on E1 even though there’s a perfectly good path from C1 to E1. If you want to reproduce the results, start with OSPF-NSSA-Forwarding-Address VIRL topology from my VIRL Github repository and add the incoming ACL Gi0/2 interface on E1. Let’s trace the path from C1 to E1. The routing entry for 192.168.1.0/24 on C1 points to A2, and A2 claims it doesn’t know anything about 192.168.1.0/24. Confusing, right? Well, it turns out the broken link between A2 and E1 also broke the NSSA area in two parts, and A2 wouldn’t consider the Type-7 LSA from E1 when running SPF as it has no intra-area connectivity to E1. The packet from C1 arrives to A2, and A2 simply drops it (resulting in ICMP unreachables observed on C1). If the forwarding address is non-zero, look up the forwarding address in the routing table. The matching routing table entry must specify an intra-area or inter-area path. Looks like a stub interface (OSPF-enabled interface with no neighbors on it) doesn’t satisfy the intra-area or inter-area path criteria. A2 thus ignores the Type-5 LSA pointing to its directly connected interface. The area nssa translate type7 always suppress-fa nerd knob suggested by Angelos Vassiliou would solve this problem (because there would be no recursive lookup for the forwarding address) while at the same time violating paragraph (2) of section 3.2 in RFC 3101. You could argue that the ABR behaves like every type-7 LSA would be aggregated into a separate address range as described in paragraph (3) of the same section. I still have to check how Cisco IOS handles the costs of such type-5 LSA. I created at least one OSPF deep-dive course, and taught it at least a dozen of times (quite often having Cisco’s TAC engineers in the audience), and I was still surprised to see this behavior. OSPF is way too complex for its own good. 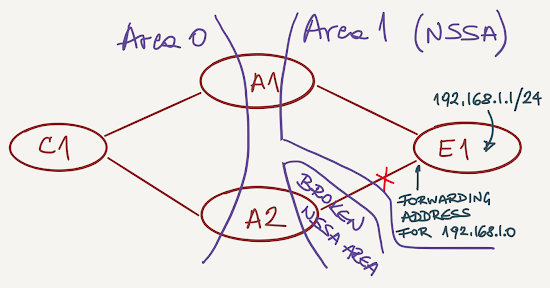 If you must use OSPF get rid of as much of its complexity as you can– use a single area if at all possible, and stay away from NSSA areas.